I have been working like crazy making tumblers and shirts and a whole bunch of other vinyl creations that I figured it was time to come on and show off some. First up is a shirt that I created for my son's 100th day of school, which just happened to also fall on Valentine's Day. 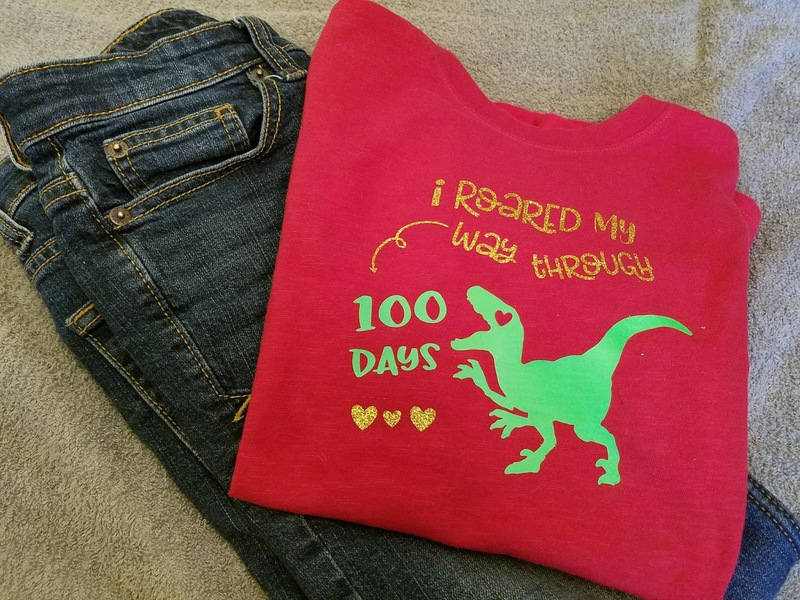 I paired some gold glitter vinyl with some dino green vinyl and placed it all on that red shirt and could not be happier. Of course if my son is getting new gear then mama needs some new gear too. 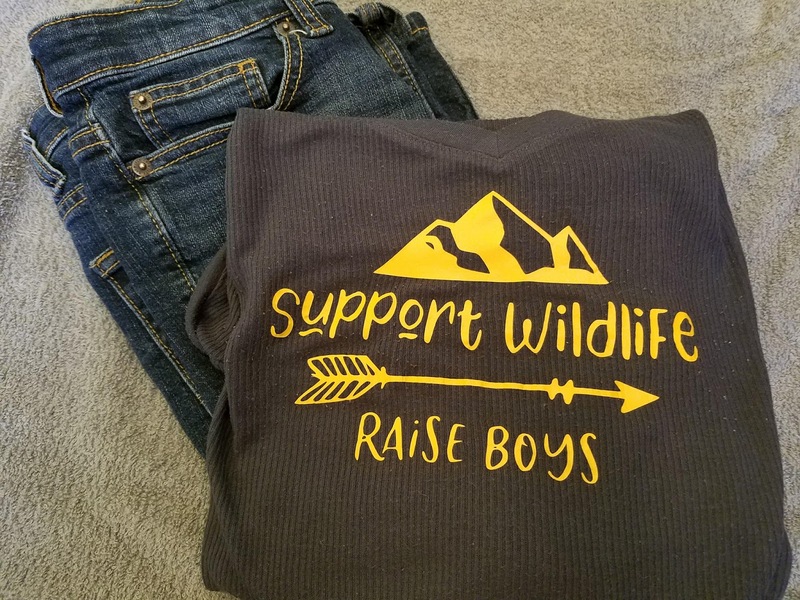 This shirt makes me giggle every time I read it. Finally moving a little ways away from shirts and onto one of my favorite holidays, Easter. 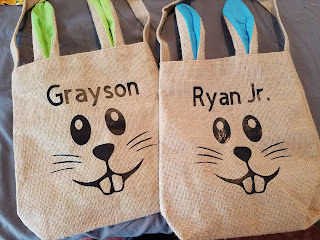 I found these super adorable bunny bags and just could not wait to put some vinyl on them. These are for a customer and are selling like hotcakes! So that's what I have been up to lately. Feel free to drop me a link below and show off some of the things you have been working on. This has been the week of challenges! On Monday I brought you a Just For Fun monthly challenge and now that it's Thursday I have a brand new Creative Knockouts Challenge for you!! I hope you love playing along with us. This is a little bit more than what I am used to putting on a card but I had so much fun with it and I love the way it turned out. Since I live in Upstate NY and you can start to feel the Spring time coming I decided to use teh image First Flower from Fabrika Fantasy. This image paired perfectly with our CTMH paper line of the month which happens to be "Make Waves." The paper and the pink glitter gems both come from that line. I then decided to use the $5 SOTM - Sunny Thoughts to finish off the card. Make sure to come on over and play along with us this week. Thanks for stopping by and Happy Crafting! 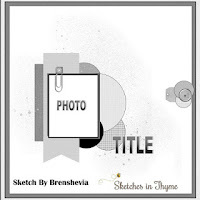 Today I have a layout which was inspired by a new (at least to me) sketch challenge blog called Sketches in Thyme. These guys post a new scrapbooking challenge sketch every week!! And so far they have been a blast to play around with. The sketch today comes from the Feb. 8-14th challenge which looks like this. Below is what I came up with. Of course since that was the week of Valentine's Day I just could not resist going all out with some red, white, and oh yea those hearts!! 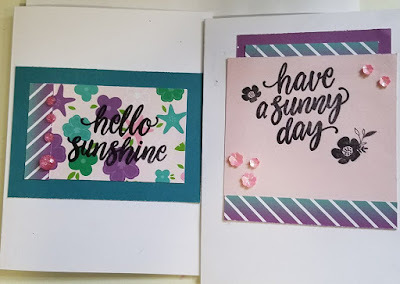 All of the designer paper came straight from CTMH Adventure's Fundamentals line then I paired it with a Cranberry and White Daisy solid colored cardstock. 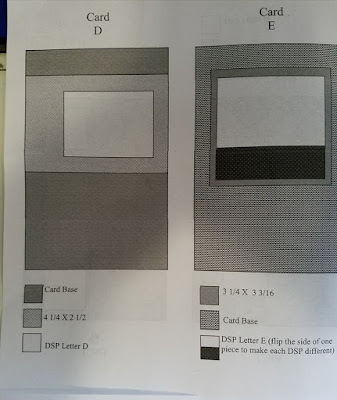 All of the elements were cut out with my Cricut using the Artbooking cartridge, also from CTMH. 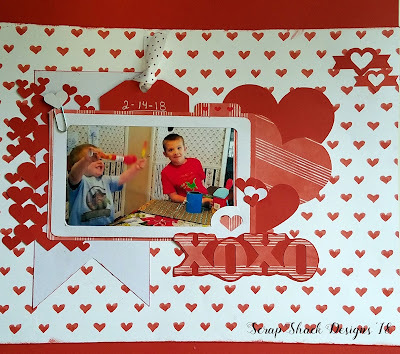 If you love scrapbooking and have not checked out this cartridge yet then head over there right now and take a look. This cartridge is filled with over 700 include accents, borders, titles, overlays, photo mats and more making traditional layouts and mini albums come together in a snap. Of course I have a process video for you where I show you how this layout all came together. Thanks for stopping by today. Don't forget to head on over and play along with the challenge and of course Happy Crafting! 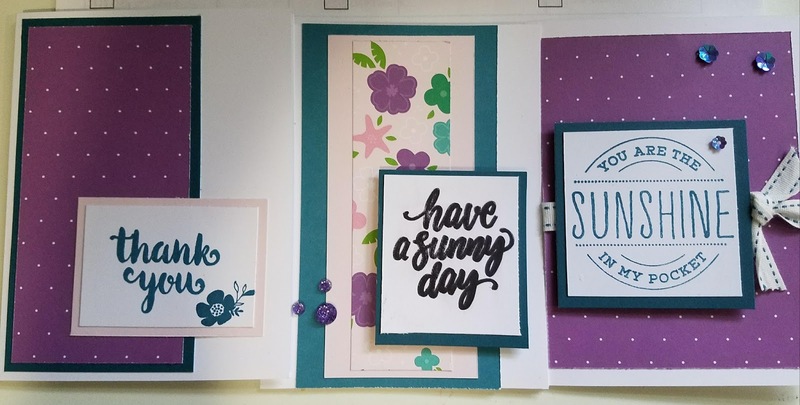 Just For Fun stamps is hosting a silhouette challenge this month and so I wanted to share a wonderful background stamp with you. I live in Upstate NY where the weather is starting to turn and Spring is on it's way so I figured why not show off some of those gorgeous summer time stamps. 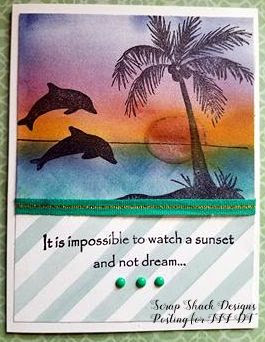 That large background stamp is called Dolphins-Palm Silhouette rightfully so and is such a fun silhouette stamp to play around with. I decided to sponge ink onto a white piece of paper to create the background and water. I then created a sun with my shimmer pen, sorry it did not come out better in the photo. After I had the background and image stamped the way I wanted it I decided to pair it up with a great summertime sentiment called ...to watch a sunset. JFF has a lot of great sentiment stamps to choose from so it was hard to pick the one I wanted, but this one is my favorite so I went with it. Thanks for stopping by today. Happy Crafting! Today, per requested, I have a wonderful OSW - one sheet wonder project to share with you guys. 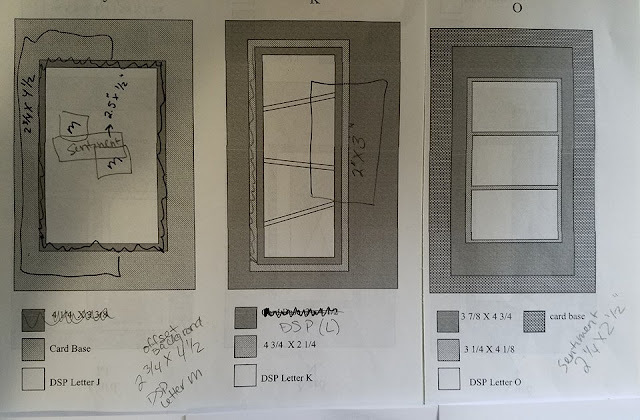 If you have never heard of an OSW it's simply a great way to get the most out of one sheet of DSP - designer series paper. I used the "Something Magical" cardmaking workshop from CTMH which just happened to pair beautifully with this month's $5.00 stamp set called "Sunny Thoughts." You can feel free to use this same workshop or you can use some material that you have on hand. Ok so let me first showed you how I cut my paper. So there are more than 10 letters on this layout, but we only made 10 cards (we just combined some to make them nicer.) Note that when I cut my papers I cut the 5" off the top then I cut the bottom into 3 sections, then I finished up by cutting out the smaller sections. I also marked the "K" pieces with my ruler then I cut them out. When I had the pieces cut out I laid them out exactly as they are pictured above on my table. This allowed me to keep track of which pieces I wanted to go where. Here is a closer view of the cards. As you can see I decorated with some ribbon and some sequins. The sequins in this pack are super adorable, they are a mixture of flower sequins and bubble dots...and they are just beautiful! 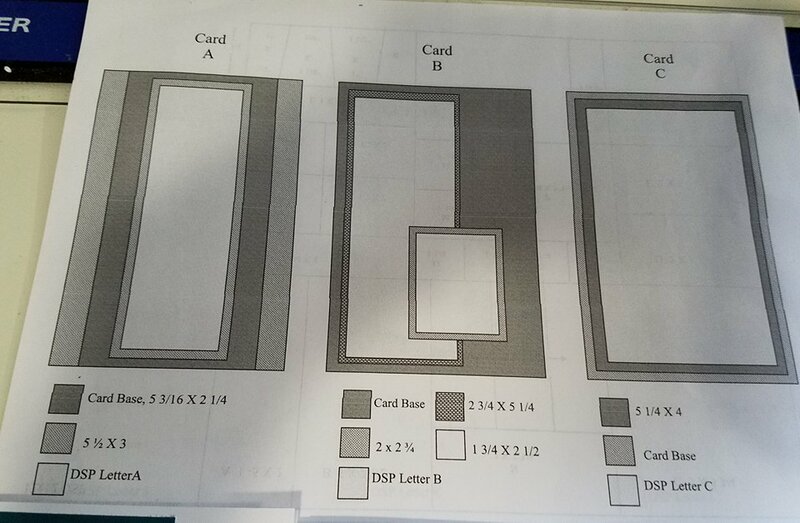 Here is a closer view of the templates that were drawn out. As I progress through the 10 cards I slowly start to add my own touches and pull away a little bit from the sketches. The sentiment mat on the third card (to the right in the photo) measures 2 3/4" x 2 3/4" with the white piece measuring 2 1/2" x 2 1/2" just in case you would like to copy it. Also if you have not caught on my two solid pieces of cardstock include the peacock and the blush papers. If you choose to use a non-neutral card base then you might only need one other piece to layer..however with the white the cards can look a little plain so I decided to spruce them up by adding the multiple colors - besides they came in the kit anyway so why not use them. Ok first off both of these cards feature our B&T strip which can be found on the top of any CTMH DSP and should never be overlooked. 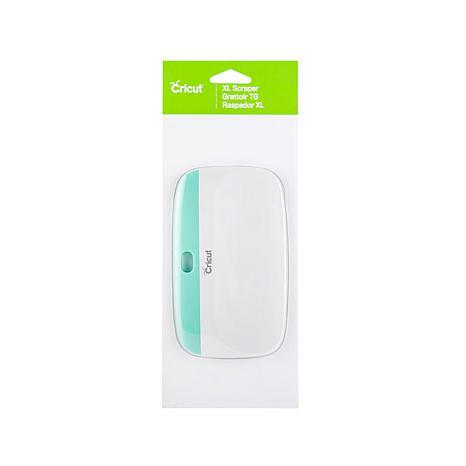 The ombre diagonal lined paper is the one that I am talking about....it's like perfectly matching ribbon with no bulk! Also for Card E I went a little off and did my own thing. First I flipped the sketch upside down. Then again I used that B&T strip to the top and bottom. Instead of layering it I simply used the 3 1/3" x 3 3/16" piece which is the one I stamped right onto. I then attached piece E to the top background above that stamped base. If that threw you off then I am sorry and you can feel free to stick right to the sketch - either way everything will work out... I promise. Moving right along you can see in the next set is where I change up the stamps a little. 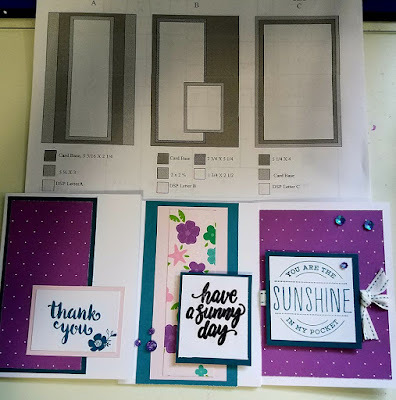 Most of the cards use the SOTM - Sunny Thoughts, however when you purchase a cardmaking kit from CTMH you also get an exclusive B-size stamp set and I wanted to show how awesome that stamp was so I used it in the next card. Note that I also cut apart my SOTM so I could make it fit onto my cards better. Ok so two things to note in this set. 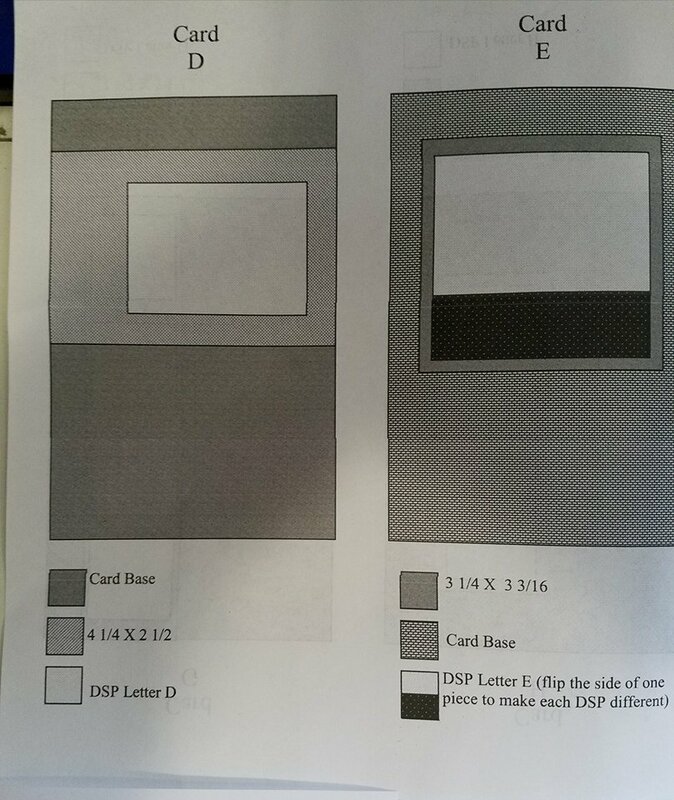 The middle card is flipped. I pushed the pieces off to the side and fit another piece of peacock paper measuring 3.5" x 3" onto the base of the card. I then stamped my sentiment right onto this added piece. Again stick to the sketches or make them your own...this is your project. I also removed the layer on the 3rd card and added a piece of white daisy cardstock measuring 1"x 3" - this was the piece that I added my sentiment to. Now to finish it off I adjusted these ones slightly and will explain it below. So I marked the adjustments on the sketches below. Let's check them all out together one more time. 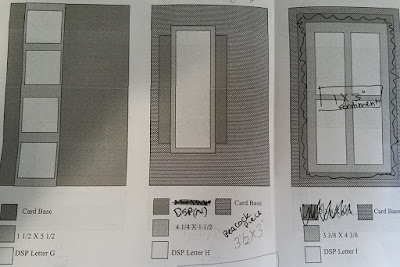 Note that all the adjustments I made were to the solid colored paper - none of them were made to the DSP so the cutting diagram stays true and accurate. Now for a group photo. You can see in this photo the two different stamps. Thanks for stopping by today! 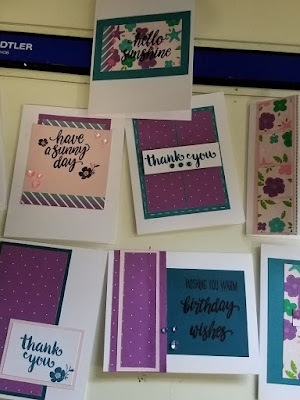 Make sure let me know below if you made these cards and feel free to share the link so we can come on over and send some love your way. So with all of that said today I have a really fun process video for you. I was inspired by the brand new sketch over at Stuck?! Sketches (which is a great place for some inspiration!) 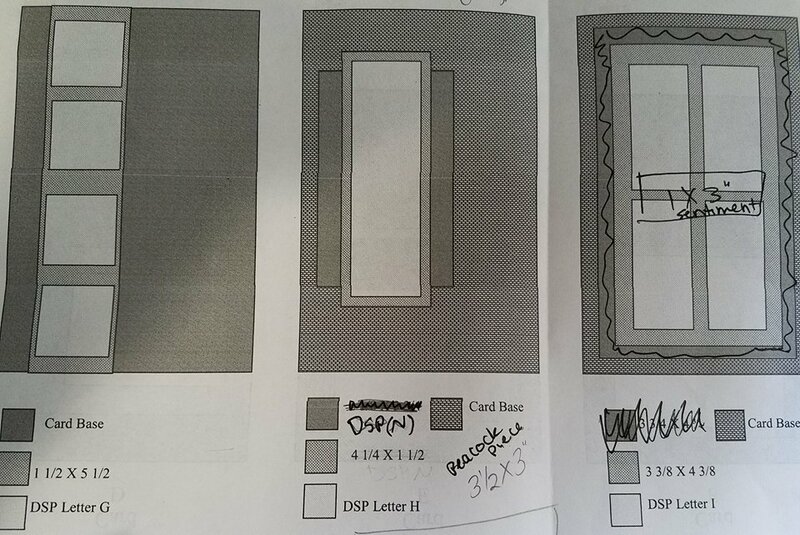 This is what the sketch looks like and boy do these design team members have some talent. These are bi-monthly challenges that run all month long so make sure to head on over there and join us. Now as I said I have a process video so I will let that take it from here. Here is a picture of the finished product. Don't you simply love that Fundamentals paper?!! And those gold accessories. I love the way this came out. Thanks for tuning in today. I hope you enjoyed and were inspired to head out and keep some memories! I wanted to come on today and not only share a project but to also cover some tips and tricks of using the Cricut Machine. Now, if you do not have a Cricut then have no fear because I do have some excellent die cuts and stamped images to share below. Now if any of you know me then you know that I am frugal, very frugal, and being frugal with my Explore machine has taught me a few things. Ok so before you head out and purchase new materials there are some things that you can do to extend the life of your tools. 2.) Tip number two is to head into your kitchen and grab a piece of aluminum foil. I always keep some right with my machine. Wad up this piece of foil into a ball, it doesn't have to look pretty, then take your blades out of the holding and jab it through the foil - being careful not to cut yourself. You can do this about 5-6 times before returning your blade into the machine and wah-lah you have an almost new, but super sharp blade. Think of this blade just as you would your kitchen blades, I know that a knife sharpener is never too far away from me in the kitchen..same concept. 3.) Tip three is all about your mats. Now I told you how to maintain your blades and your mats can be maintained as well. Besides we pay enough for all of these tools why not get the most use out of them before buying brand news ones. For me, the best way to clean your mats is to head to the dollar store (I told you I was frugal) and to purchase some "Awesome" spray cleaner. This is a yellow cleaner that has become a necessary item not only in my craft room but also in my cleaning cupboard. To clean your mats simply spray some awesome onto the mat directly then wipe off with your scraper or even just a paper towel. What this does is it takes off all of the excess paper and junk and wipes it clean. I then hang up my mat and let it dry completely and wah-lah a nice clean sticky mat that you can use. Note: I have also seen people use Dawn detergent to clean the mats. When I tried this approach my mat lost the stickiness which made it useless to me. Another tip is that if your mat is not sticky and you cannot clean it or afford a new one don't hesitate to get our the washi tape and tape down the paper corners. Ok those are my top 3 Cricut Maintenance tips for you. What tips or tricks do you ave that others could benefit from? Feel free to comment with them below or to join us on Facebook. Ok now as promised I do have a project for you. 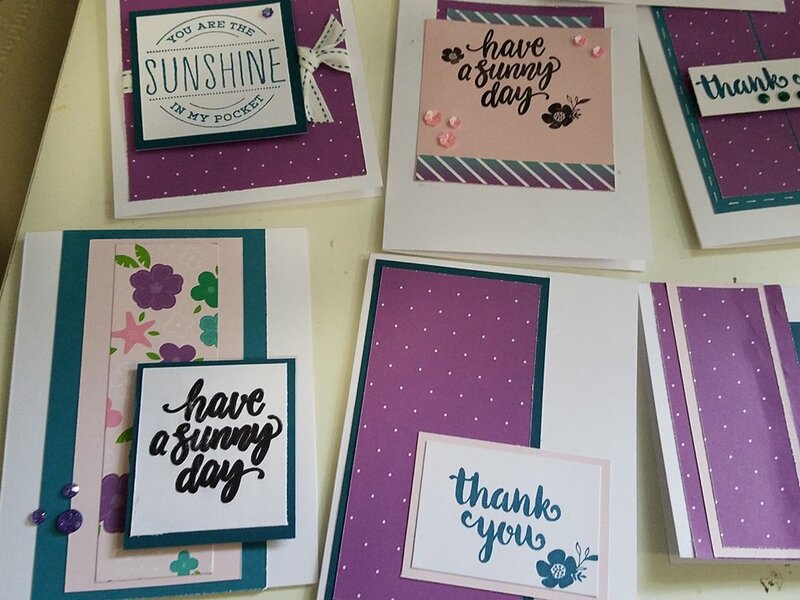 I recently took part in an Easter Die Cut swap and I wanted to come on and show you the wonderful things that I created for this swap. Sorry for the amateur photos..lol! The goal was to create 10 die cuts so I quickly grabbed my favorite cartridge (besides the CTMH ones) Create A Critter and got ready to cut. With my new blades and new mats this job went super fast and was super easy. This was my first time in 3 years purchasing new tools and man it really did pay off! Here's some close up shots of those die cuts. The chick and the bunny came from "Create A Critter" while the basket and the words came from randomly uploaded SVG files. I only recently became organized enough to sort those so I am not sure exactly where, but I would guess Marjory Ann Designs since I did a brief stint as a DT member over there. Then to add to the die cuts I decided to fussy cut out some stamped images from the CTMH "Easter Animals" stamp set. This is a set of 11 stamps and features Bunnies, Chicks, Easter/Spring sentiments, and of course some fun grass border. And my favorite of the bunch is this cute little chicky. Here's a look at the complete stamp set. Well there you have it. I leave you with a project and some tips. I hope you enjoyed today's post and don't forget to leave us your best tips below. Wow! It's already Thursday!! This month is flying by faster than January, if that's even possible. Anyway, today is the day that we start a brand new challenge over at Creative Knockouts and this week's theme is "Birthday Wishes." 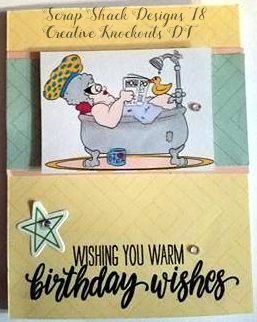 So the sponsor for this week's challenge is none other than Dr. Digi and in my card I used the Bath Time Deirdery stamp. This theme is really fun to play around with, because honestly who doesn't need birthday cards, and to make it even more enticing Dr. Digi is giving one lucky winner 2 free digital stamps!! So make sure to come on over this week and play along with us. 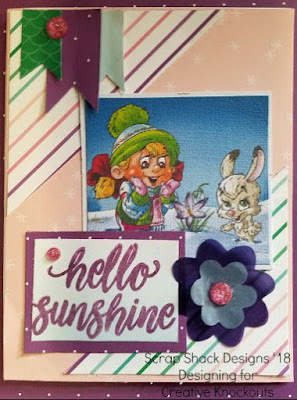 As far as my card goes I decided to feature that really cute Deirdery stamp along with our CTMH SOTM - Sunny Thoughts. 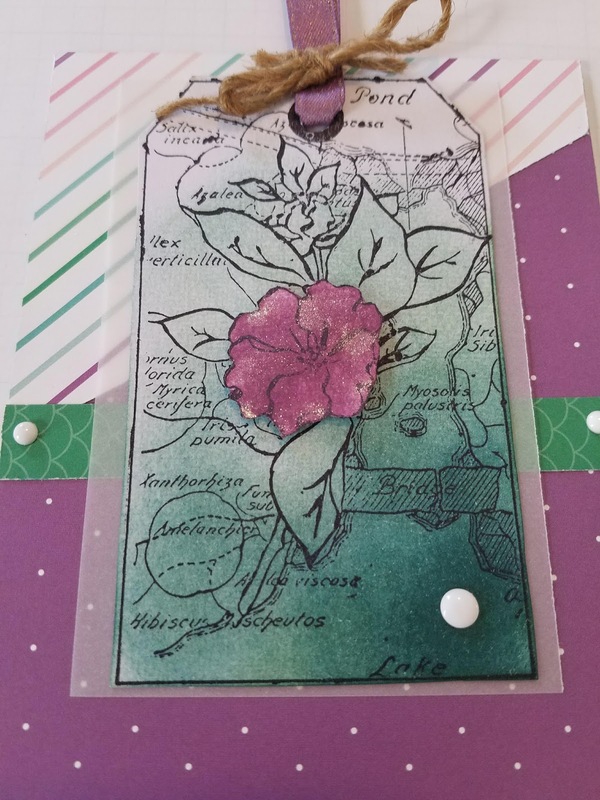 I paired these two stamps with our Adventure paper line and a hint of our Color of the Year, bashful- look closely under the image layer. To finish this card off I used some Happy Moments Complements and some Bitty Sparkles. Thanks for stopping by today. 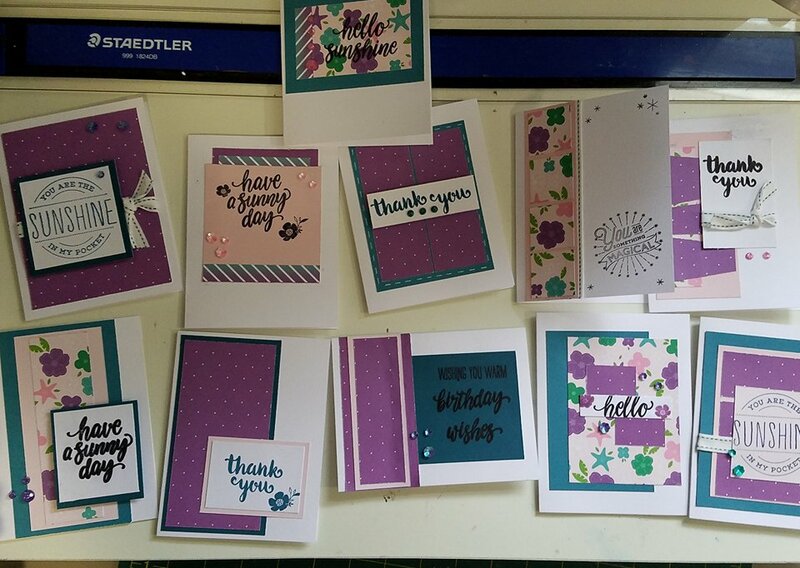 I hope you were inspired to head out and create a birthday card. 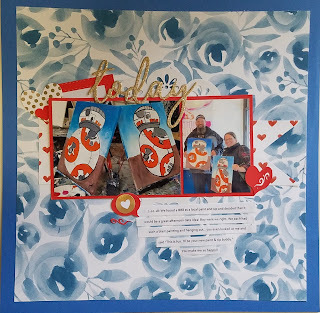 Don't forget to stop by Creative Knockouts by Feb. 14th to enter your creations. Happy Monday and thanks for joining us. 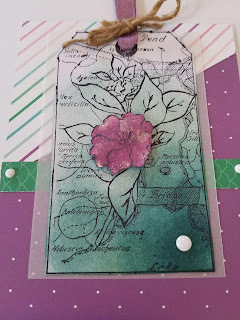 Today I have a really fun card featuring the JFF Landscape Tag. 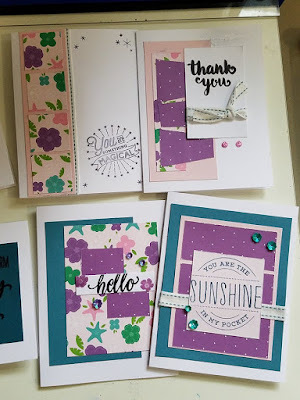 Tags are a really fun and easy project to add to a gift and can be even more fun when they double as a card topper as well, like with today's post. This card features the beautiful Peacock and Eggplant color combinations which paired lovely with the Make Waves paper collection from CTMH. Here is a closer view of that lovely and very detailed Landscape stamp. I stamped the tag in Archival Black ink and then I sponged some peacock ink around it starting in the lower right corner (where I wanted it to be the heaviest.) When sponging ink onto my images I always start off the paper then drag the sponge onto the paper. I think this method helps to prevent those annoying dark splotches that inking can cause. 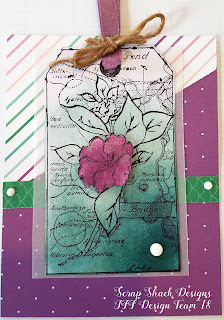 When I had the tag just the way I wanted it I stamped the image again and fussy cut out just the floral centerpiece. I used the same sponging technique for this piece except instead of Peacock ink I decided to use Eggplant ink. Once that piece was cut out and inked I applied my Shimmer Pen to give it a little sparkle and then I popped it up onto the main tag using 3-D foam tape. I finished off this tag by adding some Whimsy Ribbon, paired up with brown hemp/twine. After I had the tag completed I layered it onto some vellum paper and then placed it onto the base of the card. For the card base I decided to cut a piece of paper diagonally then added a strip across the middle. To pull through some of that neutral (white) I decided to add some white dots to the strip and the darkest corner of that tag. Is it just me or did January come and go just like that?!! I feel like I am still playing catch up from the holidays, which is good because I have tons of projects to show you starting with today's Baby Girl mini album. This mini album was created as a customer order and uses the Echo Park "Baby Girl" line. Now if you have been a long time bestie of mine then you might remember me creating a baby boy mini album using the "brother" paper line. Well I just LOVE Echo Park so much that I went straight back to it when I got this request. If you are wondering where to get these paper lines you can check out this link. 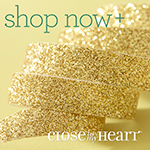 If I am not purchasing from CTMH I head straight to Scrapbooking For Less. The customer service is awesome and you get your products in 2 days!! Plus the prices are all really low so it's honestly a win, win, win! I hope you enjoyed that video. If you are interested in joining us for our monthly Creative Club we would love to have you join us over at Scrappin' Happens facebook group. 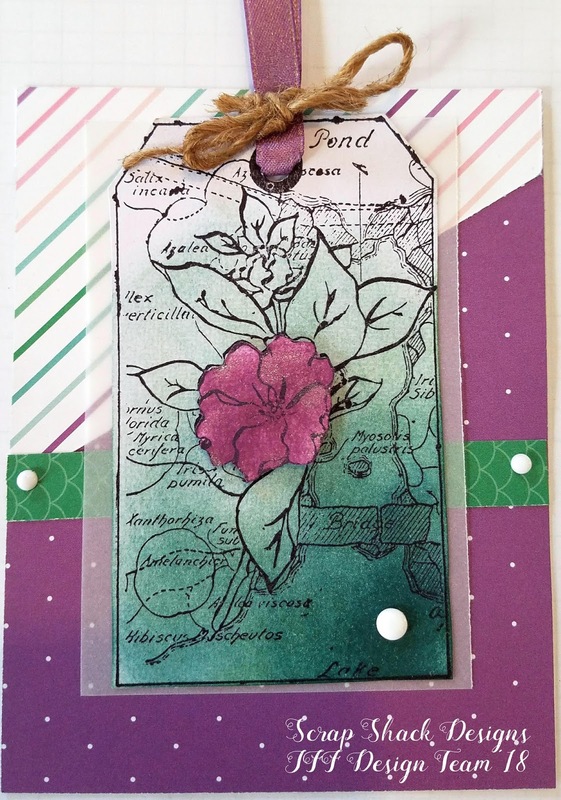 This month we are using the Kitchen Traditions Cut Above kit to create a wonderful recipe flipbook. 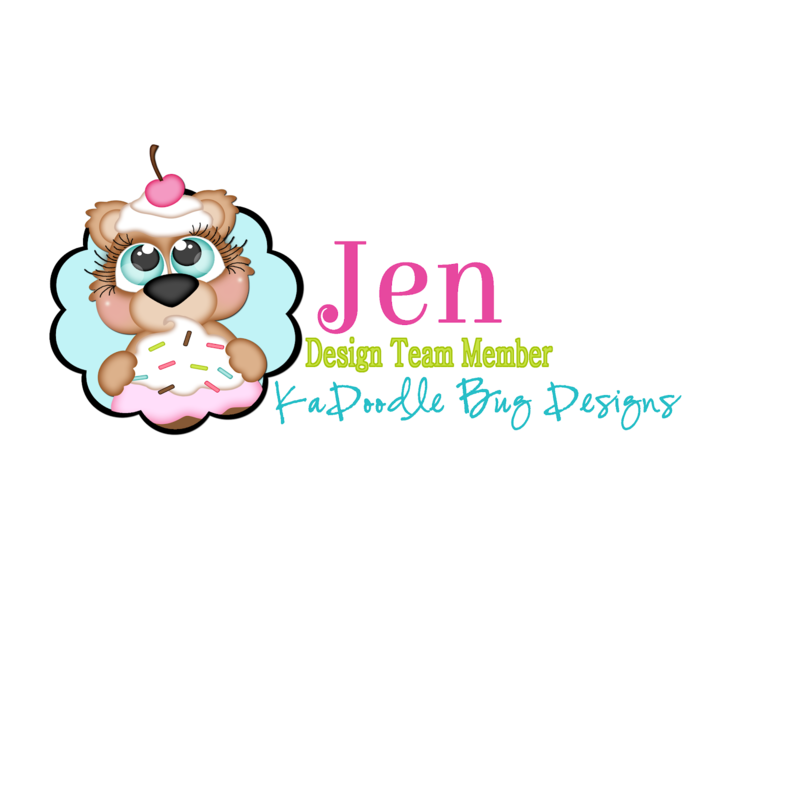 The cost of this course is a little under $27 and joining our group would give you access to Hostess Rewards, Video Tutorials, PDF tutorials, and much more.